More services and devices are being connected to the Internet than ever before. It’s becoming easier to automate routine and repetitive tasks. If I have to complete a particular activity more than a few times, I want to look for a way to automate and streamline that task. Fortunately, there’s a web service that helps me do just that. Services: Services are the apps and connected devices you use every day. Each service has useful applets you can turn on. Applets: Applets bring your services together to create new experiences by allowing you to create a “recipe” for how you want to interact with your services. The image below displays a few of the applets that I have created using the platform. For example, I created the top left applet to automatically search Craigslist for any new occurrences of the search phrase “Apple iWatch” and sends me an email with a link to the listing. I’d like to experiment with using the Apple iWatch, but don’t want to pay full price. IFTTT currently has over 360 different partners, including Amazon Alexa, Nass, Facebook, Instagram, Twitter, Fitbit, Evernote, Slack, Skype, and GE Internet-connected appliances. For example, you can have it check the forecast, and if it looks like rain, you can set it to automatically send you an email or text message to grab your umbrella. IFTTT can also automatically send you tomorrow’s forecast today at a particular time, call you with appointment reminders, or automatically bookmark new articles for you in Delicious, Digg, etc. It can be particularly useful in managing your social platform channels. One of my applets automatically adds a new row to a spreadsheet when I send out a new tweet using Twitter. Each service has its own Triggers and Actions. This combination of the service platform + Trigger + Action is called an Applet. 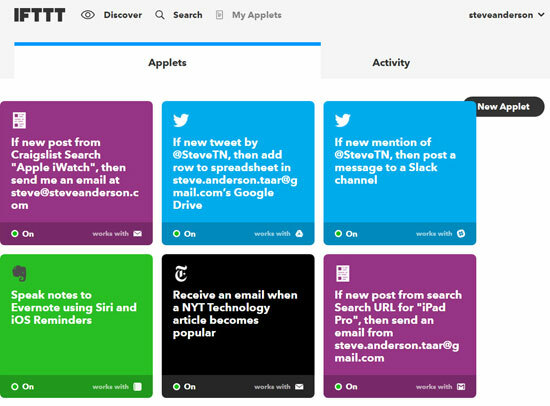 Like recipes used in the kitchen, the ingredients in an IFTTT Applet alter the outcome. Ingredients: Pieces of data from a Trigger are called Ingredients. For example, the Ingredients of an Email Trigger could be: subject, body, attachment, received date, and the sender’s address. I have used IFTTT for quite a while and find it to be a great tool. It can be a bit intimidating at first, but if you spend just a little time creating a few Applets, you’ll soon get the hang of how you can use the service to automate repeat activities. Have you used IFTTT? What do you find to be the biggest benefit? How do you think you could use IFTTT? Let us know in the comments section below. I use IFTTT for several things in my personal life. For instance, any videos I mark as “watch later” in YouTube show up in my Pocket queue. Also, I get a text every night and each morning with the weather forecast. For business purposes, I use Zapier (a similar service to IFTTT) to take each survey response we receive from our Wufoo forms and add them to a corresponding spreadsheet in Google Sheets. I have a dashboard (programmed spreadsheet) that is then able to track this information in real time as it is received. I find services like IFTTT & Zapier extremely useful with seemingly endless possibilities and combinations. It is one of the reasons why I believe the future of Agency Management Systems lies with the Tech Canary’s and Veruna’s of the world, since they are built on the Salesforce platform, which has a wide open API. Matthew, thanks for sharing these examples. I do agree that any platform needs to have an open and well documented API to allow for the easy interchange of data between systems. Zapier and IFTTT are just two great examples of the creativity that can be discovered when everyone has an idea. Great article and great tool. I use IFTTT to send me an alert on my iPhone when I get a quote request via email. Todd, this is a great example of how automation can allow you to respond faster.